Life gets difficult for cooks who toss the right things like egg shells or celery leaves in the disposal, when they see someone tossing in things that necessitate garbage disposal repair. Family members should be instructed what goes into the disposal and what goes into the garbage can. There are some guidelines homeowners should follow to avoid Garbage Disposal Replacement in San Tan Valley. Grease on food particles can solidify, causing blockages in the pipes. Running cold water while the disposer chops up the grease will eliminate this problem. 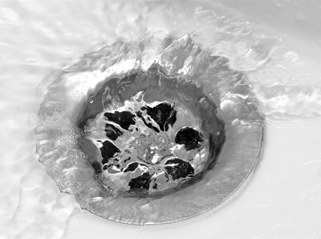 Running hot water liquefies the grease, causing blockages. Here are more tips. Cherry or peach pits, small chicken or fish bones and egg shells provide a scraping action that keeps the grinding chamber’s walls clean. Disposing of an orange or lemon won’t require garbage disposal repair, but it will smell nicer. Chop foods into small pieces. Large pieces won’t grind well and will back up the sink. Don’t jam large amounts of small pieces, for the same reason. When the blades appear dull and won’t chop, you might need garbage disposal repair. It might also be necessary when celery stalks and onion skins have wrapped around the motor. Pastas and rice should go in the trash. They expand when water runs down the drain and clogs it. Did you know starch in potato peels turn into a paste that clogs the blades? So do coffee grounds. When it clogs a lot, smells awful, the blades won’t chop or it leaks a lot, it’s time for Garbage Disposal Replacement in San Tan Valley.